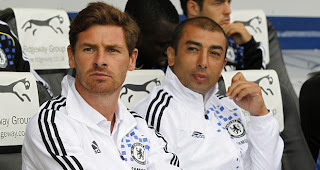 Tomorrow's game will be a poignant one for Andre Villas-Boas' wing man, Roberto Di Matteo, who was sacked by West Bromwich Albion in February. Di Matteo will take his place in the home dugout, as he comes face to face with his former club as assistant manager of the club he represented as a player. The corresponding fixture last season was Di Matteo's first as a Premier League manager and, unfortunately for him, Chelsea won 6-0. Villas-Boas said there had been "some banter" at the Italian's expense. "It will be emotional for him for sure to see people that he was very, very attached to," Villas-Boas said. "It happens the same to every manager when you face an old team. There are some strong relationships in there and I think for sure he'll salute all of those people."